For other uses, see Drum line. The batterie drumline is a section that marches on the field as a group. The batterie usually consists of snare drums, bass drums, tenor drums, and cymbals. In the past, marching timpani were common before the adoption of the front ensemble, as were marching keyboard percussion instruments such as glockenspiels and xylophones. A relatively small number of bands, mostly at the college level, continue to field such traditional marching keyboard instruments; however, most bands have phased out their use. Marching steel pans are rarely part of drumlines due to issues with volume and durability. In modern marching band and drum corps- snares, tenors, bass drums, and sometimes cymbals march on the field and are generally referred to as the Batterie, while the pit (or front ensemble) is stationary in the front of the field. In other cases, marching units may place the pit in the back or behind the band because the band may be too small for them to station the pit in the front. Sometimes, the front ensemble may have a certain position on the field in order to create a desired visual effect. Marching snare drums have high-tension heads that manufacturers typically make out of Kevlar or PET film. In the past, snares were typically carried with slings. Due to the discomfort of this angle for the left hand, a new grip was created- traditional grip. Matched grip is used in the right hand and traditional grip in the left. The stick is held with the two fingers and the thumb above the stick and two below. Most modern snare drums have rigid over-the-shoulder harnesses that hold the drum with the playing surface parallel to the ground, which affords the option of performing with matched grip. Percussionists call this grip "matched grip" because both of the hands are in the same position (matched). There are, however, many groups that are returning to a slight tilt playing style in order to make using traditional grip more comfortable for the players. Parts are typically univide the center rhythm of the drumline. The snares are the center of tempo in the ensemble. The head snare player (a position typically held by the most experienced snare drummer) is responsible for maintaining the tempo. When rehearsing or performing, the head snare may "tap off" the ensemble, setting the tempo with a solo rhythm. A snare drum can weigh anywhere between 20 pounds and 40 pounds, depending on the model and size. Marching tenor drums (also called quads, quints, tom-toms or multi-tenors) are single-headed tonal drums. Typically, they are referred to as tri-toms if there are three drums, quads if there are four, and so on for quints, and sextets. Modern tenor configurations usually have four to six drums, but there can be as few as one or as many as seven. Tenor players add pitch variety to the drumline with drums of different sizes. Tenor players use matched grip and generally play with mallets with plastic disc-shaped heads, though traditional drumsticks and softer mallets are commonly used to achieve different timbres. Tenor drummers typically play in unison. Like the snare drum line, it is sometimes common for the lead tenor drum player to "tap off", and set the tempo. Marching tenor drums can weigh anywhere between 30 and 60 pounds, depending on the model, and number of drums. There are also single head tenor drums. They are typically used on the same drum form as a snare drum, only without the snares on the bottom. Single tenor drums can also be tuned to have a high pitch so that a line of tenor percussionists can run split parts amongst them. Single head tenor drums are popular amongst the ranks of HBCU (Historically Black Colleges and Universities) drumlines, where they are used on either the basis of being knee tenors (how snare drums are played) or upright tenors (how bass drums are played). For example, the University of Arkansas at Pine Bluff (UAPB) Marching Musical Machine of the Mid-South's 2 Kold Krank tenor section uses the upright style single head tenor drums while their rivals, The Alabama State University (ASU) Mighty Marching Hornets' TTB tenor section incorporates the knee single head tenor drums. These are played using either mallets or drum sticks. 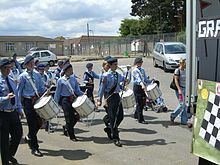 The single tenor drum is used in military bands in Italy and France, fanfare bands in Germany and in pipe bands and military marching bands in the UK and the Commonwealth of Nations, as well as in corps of drums in South America (save for Chile, Argentina and Bolivia) and a few drum and bugle corps in Taiwan. Marching cymbals are typically pairs of crash cymbals ranging anywhere from 16 to 22 inches in diameter (which are commonly used, though other sizes are also utilized) and are played in a variety of ways. Cymbals are usually bronze and most often held with leather carrying straps. Players in a cymbal line may all carry the same size and type of cymbal, or a variety of instruments may be used. It is not uncommon, however, for each player in a cymbal line to have a different sized pair of cymbals than their peers because it is an efficient way to carry out different sounds and tones depending on what the music and/or percussion director calls for. Cymbal players usually play cymbals by holding and striking them together in front the body, in unison or in split parts. Snare drummer may use them to reproduce a kit sounding part. In addition to being played by the cymbal player, snare drummers may play on the cymbals as ride cymbals or like hi-hats. Cymbals are also used for visual effects due to their reflectiveness while twirling or spinning them. Some tricks include creating letters or shapes and even the "viper," a move in which a center cymbal player jumps and ducks as two cymbal players on each side swing cymbals above and below the jump. Many contemporary field ensembles do not utilize a cymbal line, instead having cymbals played within the front ensemble. Drumlines most frequently use pitched bass drums as tonal drums split between several percussionists. Marching bass drums, which produce the deepest sound in the Batterie, are larger drums carried on harnesses or straps with the heads facing to the left and right of the player. The musicians carrying the bass drums typically line up in drum size order, but will also assume various positions for the purpose of a drill. Bass drummers use mallets with rounded or cylindrical heads often made of hard felt. High school, Colleges, and Drum Corps drumlines typically consist of four to six different bass drum sizes to ensure enough for a melody. Sometimes, in smaller bands, one may see only two or three bass drummers perform. A bass drum can weigh anywhere between 15 pounds and 40 pounds, depending on the model and size. Each drummer plays a unique part, though the entire bass drum part is conceived as a whole. This allows for a melodic passage to be carried throughout the bass drumline, having runs of notes that flow up or down the drums and in pitch. In addition to these "split" parts, bass drummers will also have unison notes, where everyone plays at the same time. In addition to splits and unison hits, sometimes the basses will play a rim click, in which they will hit a metal bar attached to the rim of the drum. This is mainly used for subdividing rhythms, and are mainly used when the snares play one or more rim shots and the basses have a unison note on the offbeat. The front ensemble (also called the pit) can include any percussion instrument. Typical front ensembles include mallet instruments such as marimbas, xylophones, glockenspiels, vibraphones, timpani, cymbals, concert bass drums, bongos, congas, cowbells, claves, tambourines, gongs, tom-tom drums, chimes, wind chimes, and in some cases drum sets. They may also include a variety of concert and world percussion instruments. Instruments may be mechanically or electronically amplified. Some competitive circuits also allow electronic instruments such as synthesizers and bass guitars, which are typically part of the front ensemble. his wide selection of instruments allows for great timbre variety. Most front ensembles are centered in front of the front sideline of an American football field. However, for aesthetic purposes, some bands choose to put the front ensemble elsewhere on the field to better to suit the show's theme. In indoor drumline competitions, however, various groups may not necessarily place the front ensemble at the "front" as the name suggests. Rather, the show designers determine placement of the front ensemble by where they would get the best sound quality, depending on the music being played. ^ "Drum Bum Glossary". Drum Bum. Retrieved 2007-11-30. ^ a b "Marching Dictionary". Drum Major Resource Center. Archived from the original on 2007-09-05. Retrieved 2007-12-05. ^ a b Casella, Jim (2006). Green Beats 06-07. Tapspace Publications LLC and The Cavaliers Drum and Bugle Corps. pp. 12–13. ^ Casella, Jim (2006). Green Beats 06-07. Tapspace Publications LLC and The Cavaliers Drum and Bugle Corps. pp. 44–47. This page was last edited on 15 April 2019, at 02:11 (UTC).